Decorating with feng shui isn't an exercise in how much white-on-white you can cram into a space. Neither is it as simple as slapping a coat of ruby red paint on the wall that corresponds to your wealth area. Selecting the right wallpaper can remedy problem areas and add vibrant energy to a room. When you lay the bagua - the feng shui map of health, wealth, fame, family and other qualities dominant in certain spaces - over your home, you'll see immediately where specific energies can be enhanced by decor and color choices. Do the same in each room to further refine the best possibilities for boosting positive chi with wallpaper. 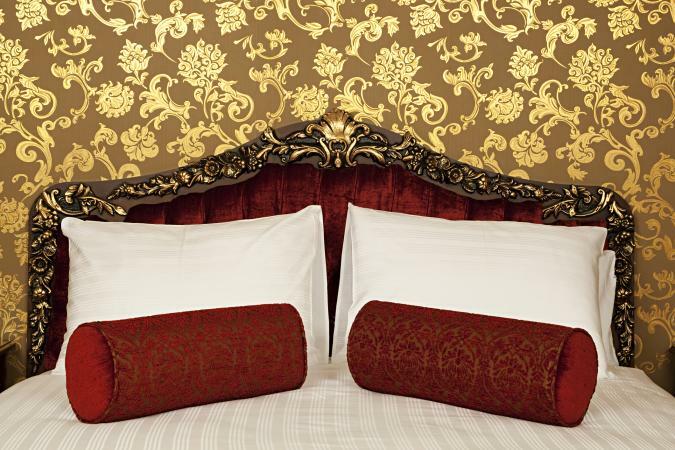 Don't be shy about adding wallpaper to your meticulously feng shui'd bedroom. A wallpaper wall behind the bed adds a sense of security to an open-work headboard and emphasizes the command position which is ideal for bed placement. If you can't avoid a sloped or slanted ceiling in an attic bedroom or a loft, wallpaper that covers the wall, any corners next to the bed and the slanted ceiling over the bed will help to make that inauspicious ceiling "disappear," creating an expansive feeling in the space. An accent wall of wallpaper could set the tone for your decor, adding strong feng shui colors for health, love, or spiritual growth. Select wallpaper with your preferred or favorite color in moderation, to prevent any imbalance or overstimulation in a calm, restful area. That might mean a beautiful panel of chinoiserie paper with a soothing background color, such as apricot or spring green, and designs in vibrant purple, rust or silver. You can invest in wallpaper that functions almost like a painting when you need a limited amount of it for just one wall or section of wall. Choose soothing colors and traditional baby motifs for nursery wallpaper, or keep that bright-eyed new addition energized between naps by her vibrant surroundings. Soft repeat patterns of baby animals - ducks, bunnies, ponies or zoo critters - flying birds, toys, or flowers may be framed by cream or pastel painted trim. Fun splotches of primary colors, like multi-sized balloons, appeal to baby's fascination with colors and shapes. Try a bright paper on the wall behind the crib or the changing table and paint the rest of the room in a pale shade picked up from or complementing the lively paper. For even greater simplicity, in a high-ceilinged room, paint walls a light color and stick a wallpaper border of ABCs or watercolor fairies at crown molding height to draw the eye up and visually enlarge the space. A sense of expansion and light is important in every room but some places get shortchanged. Powder rooms are often tucked into spare corners and lack a window, which can lead to stuck chi, an oppressive feeling or low energy. Metallic wallpaper adds glints and gleams of light to a windowless or dark room -- try an overall repeat design with a soft metallic background. Or pick metallic highlights in a matte pattern for a delicate, not-overwhelming effect. 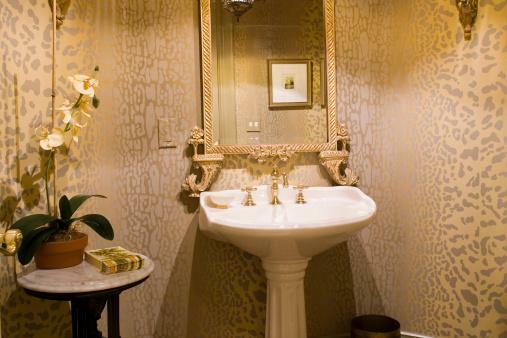 Coordinate the fixtures in the room with the metal in the wallpaper -- silvered chromes, rich golds or bronzes. Wallpaper is a way to add a feng shui element to your living space without adding clutter. You may want a water element for healing or a boost to your abundance -- but your tiny room or rambunctious toddler or pets make an indoor fountain off-limits. Try a wallpaper mural of a restful or vibrant water scene instead. The best areas to place a waterfall, lake or ocean mural are in the career, health and family, or wealth positions of the room. A touch of fabulous wallpaper lining the inside of open shelves in the living room draws attention to important family photos in your family or children areas. When your living room furniture is deliberately spare and simple, change up a tired room or add some personality to a new residence with an elegant or colorful wallpaper that complements your very Zen furnishings. Warm, stimulating hues in the red and orange spectrum enhance appetite and conversation in the dining room. Patterned paper above a chair rail gets top billing in a traditional room. Find a design that mimics the style of the room's furnishings and decor: colonial pineapples, classic European fleur-de-lis, West Indies plantation-style parrots and palm trees. A background of vivid persimmon, tomato, or pomegranate will pick things right up. Patterned paper with a gentler apricot or peach ground will make a small room seem more spacious and a breakfast room more elegant. 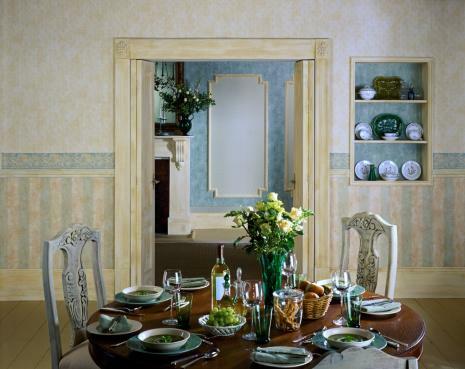 Use wallpaper to create an illusion to define the room. Measure accurately from the baseboard and use a level to install a border of wallpaper around the room's perimeter at chair rail height. With a coordinated wallpaper below the "rail" and complementary paint or another wallpaper treatment above, unremarkable walls become distinctive decor and invite the eyes to roam around the room -- good for energy flow. Stripe your home office for a blend of high energy and polished professionalism. Stripes impart a sense of order and symmetry and add dynamic visual impact to one or more walls. Black and white vertical stripes on the wall behind your desk are sharp and assertive; the wallpaper is a solid backing, which is a focal point that puts you in the ideal command position. In a tiny home office or a made-over closet office, thin variegated lighter gray stripes draw the eye upward and make the closed-in walls partially disappear. Workplace wallpaper is used to create a focal point for energy to gather and amplify. Use it in a conference room on the wall behind the head chair where the meeting leader sits or in a reception area behind the desk to create a welcoming space for incoming positive chi and guests. When a common work area features a wall with desks lined up against it, "remove" the wall with a mural that reflects a calming or enlivening nature scene or depicts some high-energy aspect of the business. The mural expands the imagination (wealth/success potential) and eliminates the energy block resulting from work stations facing a blank wall. There are no hard and fast rules for using wallpaper in feng shui decor. Some choices are just common sense and all decor picks should be guided by basic principles of color and placement to create harmony. That doesn't mean you are limited to delicate prints or accent walls. Your entry hallway might be a wall-to-wall good chi magnet entirely covered in wallpaper. Vista wallpaper could open up long-term luck and abundance in the right room. A windowless room might shake off its stuck chi with the right treatment on the walls. Always test your wallpaper ideas for "curb appeal." If you love it, it's probably working. If you don't, rethink your approach. In feng shui, natural materials rule. The energy of the living fiber complements the rest of the carefully selected elements you use to decorate your space. Look for fine wallpaper made of grass-cloth, woven bamboo fiber, thick matte paper, or silk fabric for a special room, a narrow wall or an accent wall in a public area of your home or in a bedroom. Grass-cloth in the family room, embroidered silk or washed taffeta in a hallway, bamboo wallpaper covering the eat-in corner of the kitchen adds texture and interest to the walls. Splurge on a painted silk scene for just one wall of a bedroom -- behind the bed to create a dramatic "headboard," for sweet dreams. The five feng shui elements correspond to spatial directions and colors. One way to limit your wallpaper palette is to choose colors based on the element in a space. Fire's colors are red, orange and yellow; water's colors are all blues; wood is nature colors, especially greens and browns, sometimes purples; earth's colors are brown, beige, terra-cotta, stone, some dull yellows and other muted shades; metal's colors are silver, gray, black and white. For example, a bedroom in the West or Northwest has a metal element and get good energy from a vertical pattern of stylized birch trees in grays behind a metal bedstead. Wander happily through wallpaper aisles in home decor shops or peruse the many online sources for fabulous feng shui wallpapers. Take careful measurements, adjust for matching patterns, and always order a bit more than you estimate you will need to ensure that a misstep or miscalculation doesn't leave you with a gap to fill. Griffin & Wong sells chinoiserie papers that are hand-painted, custom luxury investment-grade options. The paper has classic Chinese themes such as lucky flowers, birds and plants in a full range of muted and vivid colors. A hand-painted panel 3 foot wide by 10 foot tall will set you back about $395. 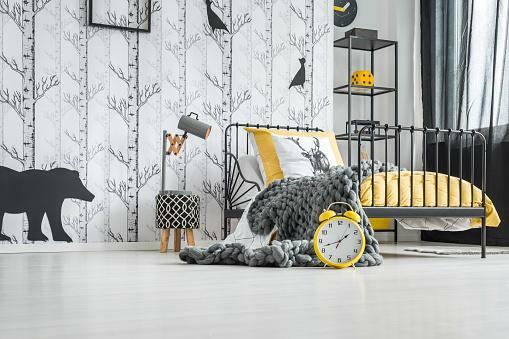 Find less expensive wallpaper designs from York at Inside Wallpaper. A double roll covering 20.5 inches by 33 feet costs about $50. NSR Handcrafts offers silk painted and embroidered luxury wallpapers that are priced to match. A 36- by 95-inch panels start at $200. It's useful for accent walls and above-the-chair rail. 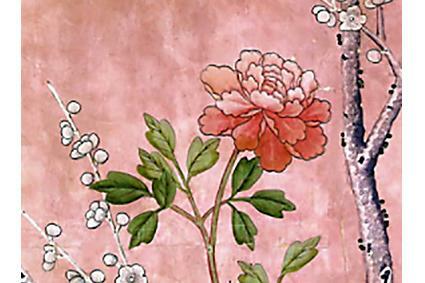 Houzz offers Asian wallpaper and murals. They come in paper, textured, and grass-cloth designs, priced mid- to high-range. A wide variety of Asian-inspired and other papers from about $14 for border designs to $13 a square yard for grasscloth to $50 and up for rolls of vinyl papers. Wallpapers & FabricsToGo sells paper, fibers, metallics, and contemporary wallpapers -- a virtual emporium of everything. All kinds of wallpapers and murals are available, starting at $7.99 a roll for closeouts with most pricing in the mid-range. Anthropologie sells beautiful and bright high end papers and murals. A stunning 8-panel flower mural that covers almost 120 Square feet for an equally stunning price of $598. Wallpapers from about $78 a roll and up. Wallpaper Boulevard sells a huge variety of discount wallpapers, borders, and murals in modest to moderate price ranges. Lots of papers start around $12.99 a roll but the minimum purchase is 2 rolls. Feng shui isn't about limits, it's about expanding possibilities. Decorating with wallpaper is one option to add to your good chi toolbox -- another way to introduce positive energy to a space, along with a healthy jolt of personality. Avoid too many clashing patterns in one area -- if the wallpaper is patterned, opt for solid upholstery and a rug with simple lines to avoid an impression of clutter. Stand-out wallpaper is its own wall art and may not need any additional hung art to embellish it. 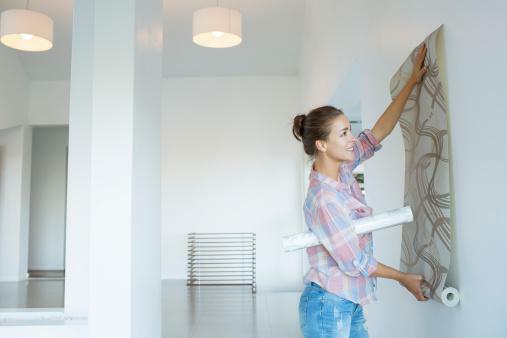 If you're feeling indecisive, peel-off wall coverings let you test an attractive idea to determine its effect on the flow of positive energy -- without any messy regrets to scrape and strip off if you change your mind. Paste a delicate design of symmetrical bamboo or a photographic mural of a stunning national park vista on an undistinguished wall that needs a jolt of fresh energy. Whitewash and crystals are fine feng shui design but your personality and taste deserve their moment, too. Wallpaper can help you to create feng shui decor that delivers good fortune and good looks from baseboard to crown moulding on one wall or all the walls of your space.